Two years ago I was invited to Texas by Tom Yancey (Texas A&M) to look at some curious wiggly tubular fossils in the Lower Permian (about 280 million years old). They form small reefs a meter or so across and have traditionally been referred to as serpulid worm tubes. We suspected otherwise. 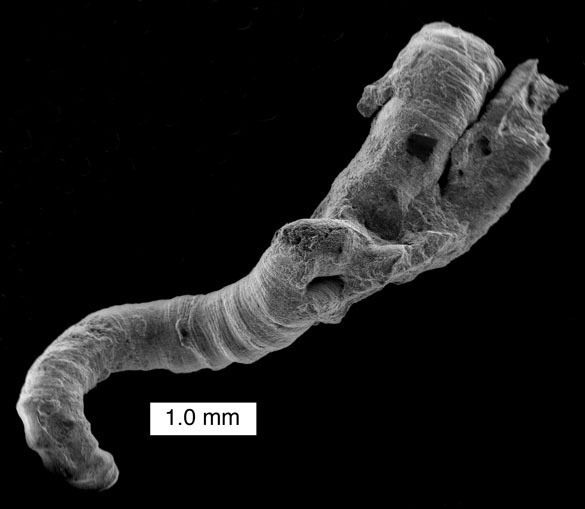 After field and lab work, and collaboration with our Estonian colleague Olev Vinn, we determined that they are a new genus and species of microconchid. Our paper describing this taxon has just appeared: Wilson, Vinn and Yancey (2011). A tangled collection of Helicoconchus elongatus Wilson, Vinn and Yancey 2011. Helicoconchus elongatus is, as you may suspect from the name, an elongate coiled tube. The walls are impunctate (meaning they have no pores) and have diaphragms (horizontal partitions) with little dimples in their centers. They have two kinds of budding: fission (shown in the top image) and lateral budding (shown below). 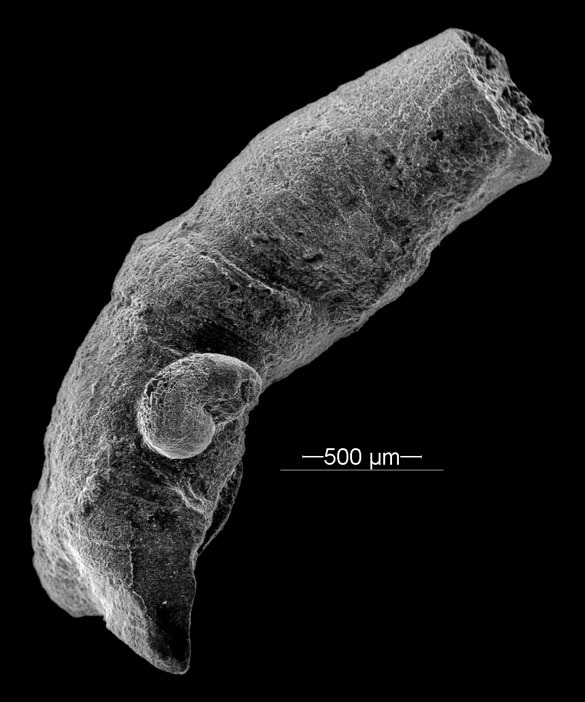 They grew into thick intertwined disks in shallow marine waters where they lived with snails, clams, echinoids and foraminiferans. A small lateral bud on the side of a microconchid tube. 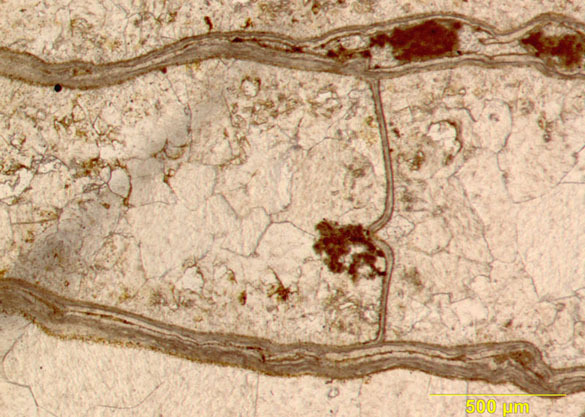 An acetate peel showing a longitudinal cross-section of a microconchid tube. The thin diaphragm running vertically in this image shows an inflection for the "dimple". Microconchids (Ordovician – Jurassic) are an evolutionarily interesting group because they appear to be related to bryozoans and brachiopods (much to everyone’s surprise). This is based on their shell structure and their manner of budding (Zatoń and Vinn, 2011). Helicoconchus elongatus will tell us much about the relationships of microconchids to other groups because of the detail we can see in its budding styles and its marvelous preservation. Helicoconchus elongatus in the field.